"Horseshoe Diamond and Pink Sapphire Ring"
Horseshoe ring beautifuly set with diamonds and genuine pink sapphires and handcrafted for the horse enthusiast. If you love diamonds and pink sapphires. You will absolutley fall in love with our Horseshoe diamond and pink sapphire ring custom crafted for the western side of you or the horse show side of you. Dimensions: 8mm wide at the top of the ring tapering down to a 2mm comfort shank. 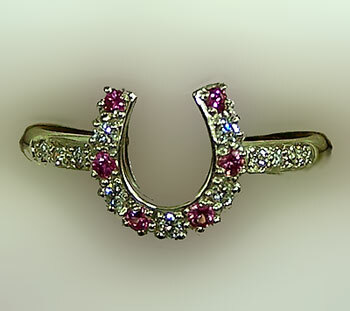 Horseshoe is set with genuine pink sapphires and matching diamonds and crafted from 14kt yellow and 14kt white gold. Stone weight .18ct of diamonds and .12 ct of pink sapphires. Have this design made your way by using our comments and request box below for that special gift today!